Mr. Charles Lester Kenyon “Windy” Wilburn, age 91, of Grahn, Kentucky, passed away Tuesday morning, October 23, 2018, at Carter Nursing and Rehabilitation Center in Grayson, Kentucky. He was born February 20, 1927, in Carter County, Kentucky, a son of the late Estill “Jim Bob” and Gaythel Ingraham Wilburn. 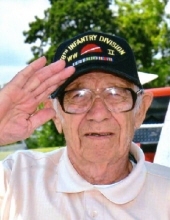 Windy proudly served his country in the United States Army during WWII. He enjoyed going to sporting events, socializing with others, joking, listening to bluegrass music and spending time with his family, especially with his grandchildren. In addition to his parents, he was preceded in death by one son, Charles Mitchell Wilburn; one brother, Louis Maxwell Wilburn; and two sisters, Thelma June Carroll and Erma Jean Pope. Windy is survived by his wife of 67 years, Wanda Blevins Wilburn; two sons and three daughters-in-law, Randy and Judy Wilburn of Ashland, Kentucky, Scott and Christy Wilburn of Morehad, Kentucky, and Eleanor Mauk Wilburn of Grahn, Kentucky; six grandchildren; four great grandchildren; one brother-in-law, Lewis Carroll of Grahn, Kentucky; and one sister-in-law, Rosa Brown Wilburn of Dayton, Ohio. He also leaves many other family members and friends who will sadly miss him. Funeral services will be held at 11 a.m. Friday, October 26, 2018, at Globe Funeral Chapel in Olive Hill, Kentucky, with his nephew, Bennie Carroll. Burial will follow in the Kentucky Veterans Cemetery Northeast in Greenup County, Kentucky, with full military honors presented by the Kenova American Legion Post #93. Friends may visit from 6 p.m. to 9 p.m. Thursday, October 25, 2018, and after 9 a.m. on Friday at Globe Funeral Chapel, 17277 West Highway US 60, Olive Hill, Kentucky 41164. In lieu of flowers, the family request that donations be made in Windy’s memory to Grahn Community Center or the Grahn Fire Department. "Email Address" would like to share the life celebration of Charles Lester Kenyon "Windy" Wilburn. Click on the "link" to go to share a favorite memory or leave a condolence message for the family.